The Otomí Ñhañu, Ñathö, Hui hú, and Matlatzinca peoples from México State and Michoacán are being attacked via the imposition of a megaproject to build the private Toluca-Naucalpan Highway and an inter-city train. The project is destroying homes and sacred sites, buying people off and manipulating communal assemblies through police presence. This is in addition to fraudulent community censuses that supplant the voice of an entire people, as well as the privatization and the dispossession of water and territory around the Xinantécatl volcano, known as the Nevado de Toluca. There the bad governments are doing away with the protections that they themselves granted, all in order to hand the area over to the tourism industry. We know that all of these projects are driven by interest in appropriating the water and life of the entire region. In the Michoacán zone they deny the identity of the Otomí people, and a group of police patrols have come to the region to monitor the hills, prohibiting indigenous people there from going to the hills to cut wood. The Tzotzil, Tzeltal, Tojolabal, Chol and Lacandón Maya People of Chiapas continue to be displaced from their territories due to the privatization of natural resources. This has resulted in the imprisonment and murder of those who defend their right to remain in their territory, as they are constantly discriminated against and repressed whenever they defend themselves and organize to continue building their autonomy, leading to increasing rates of human rights violations by police forces. There are campaigns to fragment and divide their organizations, as well as the murders of compañeros who have defended their territory and natural resources in San Sebastián Bachajon. 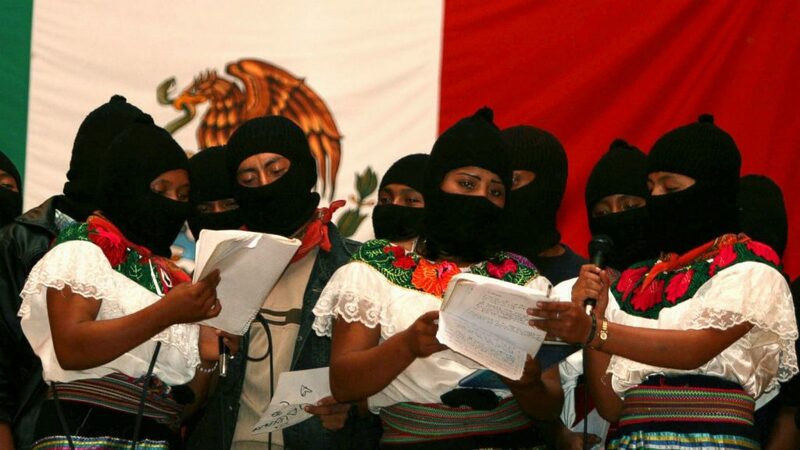 The bad governments continue trying to destroy the organization of the communities that are EZLN bases of support in order to cast a shadow on the hope and light that they provide to the entire world. The Nahua people, who live in the states of Puebla, Tlaxcala, Veracruz, Morelos, Mexico State, Jalisco, Guerrero, Michoacán, San Luis Potosí, and Mexico City, are in a constant struggle to stop the advance of the so-called Proyecto Integral Morelos, consisting of pipelines, aqueducts, and thermoelectric projects. The bad governments, seeking to stop the resistance and communication among the communities are trying to destroy the community radio of Amiltzingo, Morelos. Similarly, the construction of the new airport in Mexico City and the surrounding building projects threaten the territories around Texcoco lake and the Valle de México basin, namely Atenco, Texcoco, and Chimalhuacán. In Michocan, the Nahua people face the plunder of their natural resources and minerals by sicarios[hitmen] who are accompanied by police or the army, and also the militarization and paramilitarizaiton of their territories. The cost of trying to halt this war has been murder, persecution, imprisonment, and harassment of community leaders.